University Student. Freelance Writer. Frequent Netflix Watcher. All-Around Arts Enthusiast. In a truly intimate space, known as The Deluxe, sit two comics awaiting an audience. Their goal? To condense the majority of the Marvel Cinematic Universe into one hour of non-stop laughs and fun. From the moment the show began, to the moment it ended, the anticipation of what was coming next was almost too much to bear. I could see the half the audience on the edges of their seat as they waited impatiently, anticipating the next set of jokes and the other half still doubled over, attempting to regain some oxygen into their system and focusing on recovering for the next bout of hilarity. The electricity in the audience from watching these two men in onesies act out both alternate scenes from the films and their favourite scenes, was truly a side splitting experience. One thing was obvious, both Gary and Javier were passionate about the content they produced. From watching them talk to the audience and act out their skits, it was obvious that these were two people who were actually genuinely interested in their show and that is something that truly makes a comedy act stand out from the crowd and I commend them on their work. Gary and Javier have the audience in the palm of their hand and no-one is complaining. As an avid Marvel fan myself, I couldn't help becoming enthralled in their truly "Marvelus" (see what I did there?) brand of comedy. If you're a fan of Marvel, I guarantee this show will not disappoint. I, for one, will definitely be seeing this show again. 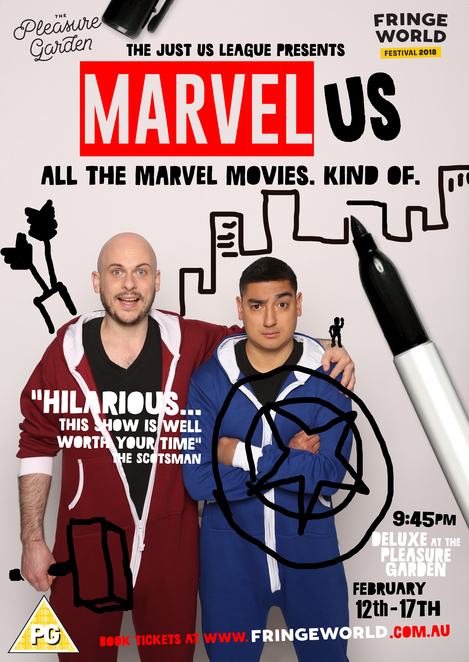 MARVELus: All the Marvel Movies. Kind of. plays at The Deluxe, located in the Pleasure Garden from the 12th -17th Feburary.